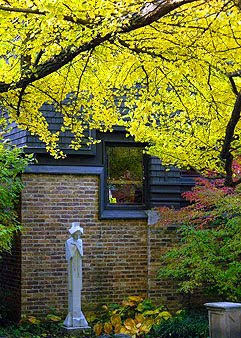 "Until it gave up in 1992, there was a ginkgo tree in front of Frank Lloyd Wright’s first home in Oak Park, Illinois. The one pictured above still thrives behind the home and to the side of the studio addition. The historic site book shop is named for it. ....A few days ago while watching the ginkgo in our backyard drop nearly all of the green jewels of its crown in the span of just a few hours, I began to wonder what role the ginkgo might have played in the evolution of Wright’s Prairie Style."